After a very long hiatus, I am back doing software development on a Microsoft Windows machine. 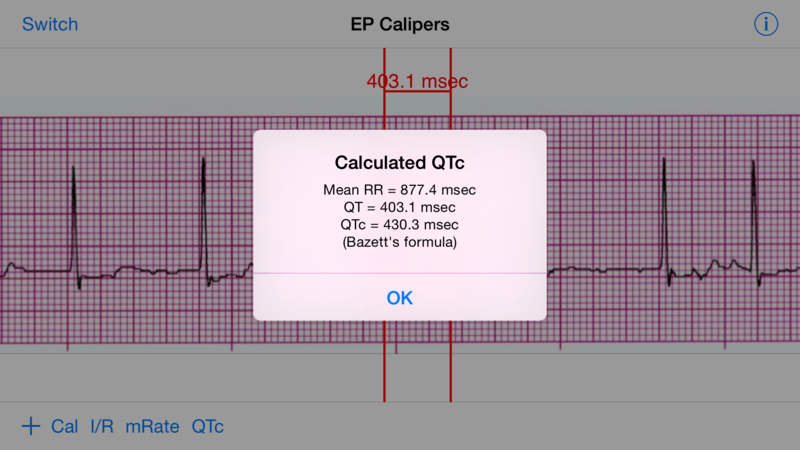 I decided to port EP Calipers, an app for making electrocardiographic measurements that is available on Android, iOS and OS X, to Windows. Several users had written to me and asked me to do this. Ever eager to please, I have launched into this project. And it has not been easy. I am no stranger to Windows development, having developed a Windows database system for tracking and reporting electrophysiology procedures while at the University of Colorado in the 1990s. But it would not be overstating the matter to say that my Windows development “skillz” are rusty at this point. I have been living in the Unixy world of Apple and GNU/Linux for several years now, avoiding Windows other than when I had to, such as when I was required to use the ubiquitous Windows 7 systems running nightmarish EHR software at the various hospitals where I worked. I have not done any programming on Windows machines for many years. Transitioning back to Windows development has been, to put it mildly, difficult. I have no complaints about Visual Studio. It is free and seems to be a very well-designed IDE, at least as good as, if not better than, Xcode and Android Studio. I like C#, which is like a cross between C and Java. Visual Studio can interface directly with GitHub. Given all this, what’s my problem with developing on Windows? The problem originates in the command line environment of Windows, an environment that dates back to the beginnings of personal computer with the introduction of MS-DOS back in 1981, a system based on the CP/M disk operating system that dates even further back to the 1970s. Windows, which has made backward compatibility almost a religion, still uses a command line system that was written when disks were floppy and 8 inches in diameter. Of course, Unix is just as old, but Unix has always remained focused on the command line, with an incredible plethora of command line tools, whereas with Windows the command line has remained the unwanted stepchild to its GUI. 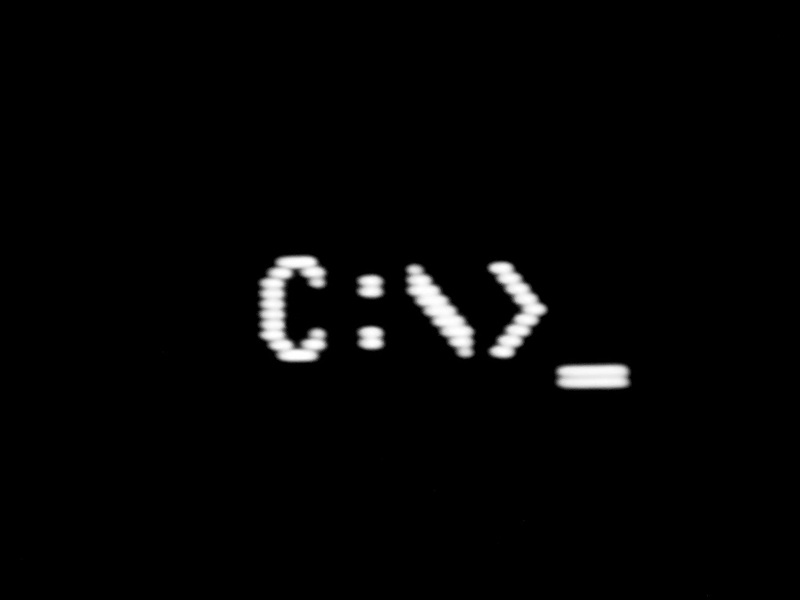 Worse, the syntax of the Windows command line is incompatible with the Unix command line: backslashes instead of front slashes, drive letters instead of a root-based file system, line endings with CR-LF instead of LF, and so forth. So, in order to ease the pain of transitioning to Windows, I needed to install a Unix environment. Even though Bash is coming to Windows, for now I downloaded MSYS2 which seems to be the preferred Unix environment for Windows nowadays. Using the pacman package management tool, I downloaded various binary packages that I needed, such as Git and Emacs. I faced the challenge of setting up my Emacs environment on Windows. My .emacs (actually ~/.emacs.d/init.el) startup file that works well on my Mac, loading various Emacs packages and customizations, didn’t do so well on Windows. I updated my .emacs using use-package so that it was easy to disable packages I didn’t want, and so that the full .emacs would load even if packages were missing. With some tweaking and downloading of various packages, I got Emacs up and running on Windows. For some reason the Emacs couldn’t find its own info (help) files, but further tweaking fixed that. With Emacs and Git working, I started a new repository on GitHub and was pretty much ready to start developing. Except, more issues. Little things that take time to fix and can drive you crazy. An example: I had created some soft links to some files that I share on Dropbox, using the usual Unix ln -s command. The files were created, but weren’t actually linked. Apparently ln is just an alias for cp in MSYS2. There are no warnings about this when you run the command, but a Google search proved this to be correct. Fortunately Windows provides a true linking command mklink, and I was able to create the links I wanted. But all this just served to remind me how the Unix compatibility shells in Windows are just roughly pasted wallpaper over the rotten old MS-DOS walls. Now I was ready to start developing, but I was faced with a question: what platform(s) to target? It is possible to develop a Windows Universal app, that theoretically can run on anything from a PC to a phone. This sounds ideal, but the devil is in the details. The types of controls available for developing a universal app are more limited than those available for a standard Windows Forms program. For example, the control used to display an image in a universal app (named, oddly enough, Image) is sealed, meaning it can’t be extended. I really wanted something like the PictureBox control available with Windows Forms, but this is not available in the universal API. So I have tentatively decided to develop a more traditional Windows Forms app, able to run on PCs and tablets like Microsoft Surface. The Windows phone may be fading into the sunset anyway, so it doesn’t seem worth it to jump through hoops to target a platform that is teensy-weensy compared to Android and iOS. I should mention that I did try the bridge that Microsoft has developed to port iOS programs written in objective C over to Windows. Long story short, it didn’t work, as many parts of the iOS API haven’t been fully ported yet. Maybe someday this process will be easier. I’m sure experienced Windows developers will read this and just chalk it up to my own inexperience as a Windows developer. I would respond that, as someone who is a cross-platform developer, it really is difficult to transition from Unix or BSD-based systems like Apple or GNU/Linux to Windows. I think Microsoft is trying to fix this as evidenced by their recent embrace of open-source code. Visual Studio is an excellent IDE. Nevertheless problems like I’ve describe do exist and will be familiar to anyone who has made the same journey I have. I’d advise anyone like this to keep on plugging away. In the immortal words of Jason Nesmith: Never give up! Never surrender! Ever since the 1990s, when computer-based electrophysiology (EP) systems were introduced, HV intervals and ventricular tachycardia cycle lengths have been measured in the EP lab by electronic calipers — simple but accurate measurements accomplished on-screen using a track ball or a mouse. Despite this, physicians still often carry a physical pair of calipers, perhaps preserved from the pre-Sunshine Act days when they were provided for free by drug companies. They use these calipers to measure heart rates and QT intervals on printed electrocardiograms (ECGs). 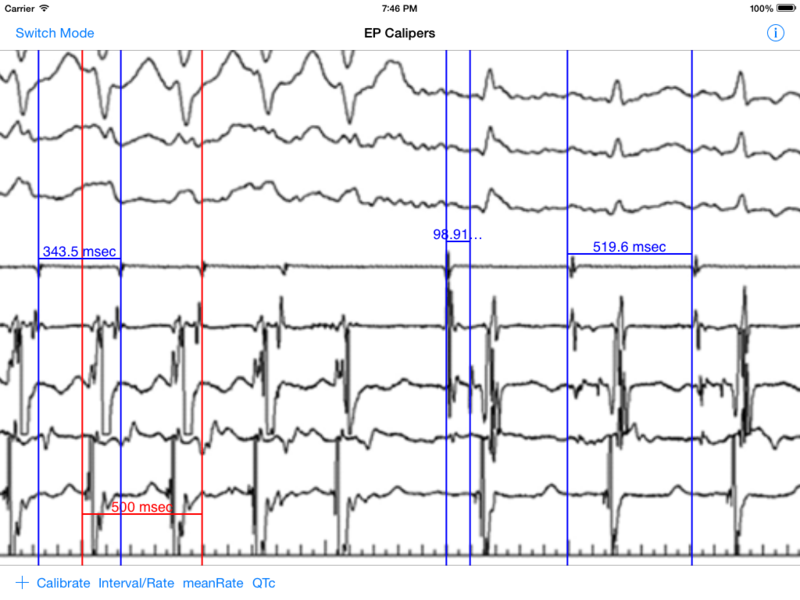 But more and more, ECGs are viewed electronically. 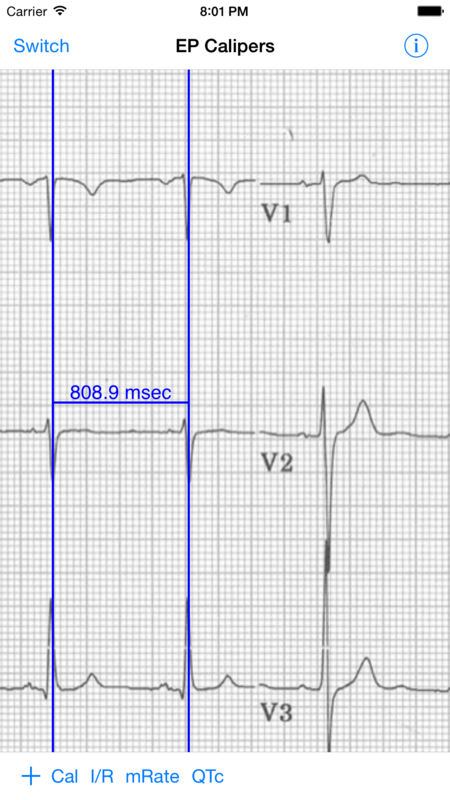 All physicians now use smart phones and frequently send and receive photos of ECGs or rhythm strips for analysis. 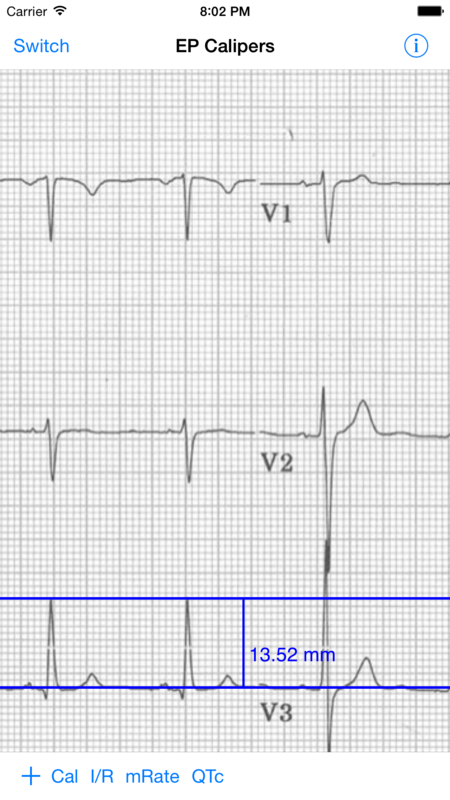 For example, when I was on-call there would often be a patient who went into atrial fibrillation in the middle of the night, or a patient who would be due a dose of dofetilide (a potentially dangerous QT interval prolonging drug). The nurse would have a rhythm strip or ECG that needed analyzing and the easiest way to do that in the post-fax machine era was for them to take a photo with a smart phone and text or email it to me for analysis. 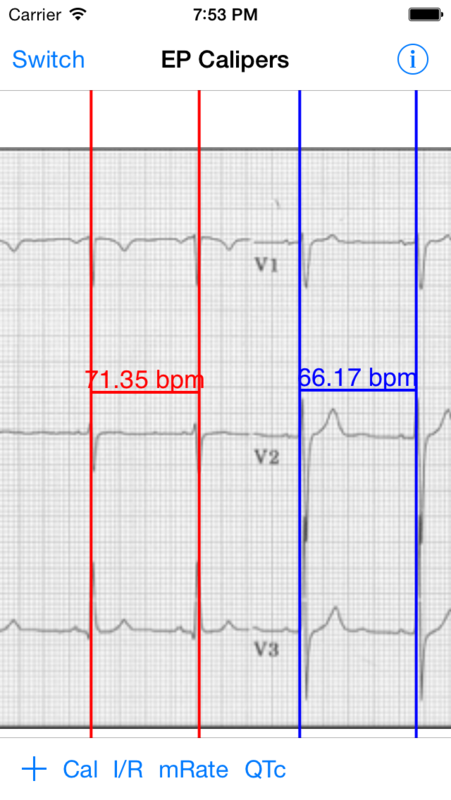 Measuring heart rates or corrected QT intervals requires the use of calipers, but physical calipers don’t work well with smart phones — maybe even scratching the glass screen! Electronic calipers akin to those used in the EP lab would be useful to make accurate measurements on ECG and rhythm strip images. I did not realize that there weren’t any apps (as far as I can tell) providing electronic calipers until this was pointed out to me by one of my Twitter buddies, Dr. Michael Katz. So I wrote an app, EP Calipers, that provides these calipers. As the screen shots show, these calipers look just like those provided by EP recording systems, such as the GE (formerly Prucka) Cardiolab system. Multiple calipers can be used at the same time. Both time and amplitude calipers are available. Unlike real calipers, it is possible to zoom images and make much more accurate measurements. Also unlike real calipers, it is easy to measure mean heart rates and calculate QTc intervals automatically. The app makes the necessary calculations. I am hoping these electronic calipers will be easy to use and helpful to anyone who has to deal with ECG recordings. This is the first iteration of the app and I am open to suggestions to improve it. Right now the app is available for Apple iOS (version 8.1 or higher required), but the Android version will be available Real Soon Now. Have fun measuring intervals electronically to your heart’s content!